We’re longtime admirers of Creatures of Comfort. The joyful brand is as elegant as it is whimsical and pairs well with the Steven Alan collection. The brand’s founder and designer, Jade Lai, has a very strong vision. This vision is communicated ever so poetically each season in her highly anticipated runway presentations. We were lucky enough to experience her collection for Fall-Winter 2016 in the romantic, dimly lit setting filled with melancholic, yet magical music and tons of anxious enthusiasts. As the procession began, each look awed observers with rich fabrics, ruffles, and playful prints that paid homage to Dutch romanticism and some charmingly lovesick characters of 17th century theatre. After some time spent digesting (and deciding what to get!) we sat down with Lai to discuss the collection further. Creatures of Comfort collections are always very authentic to the brand's DNA. While consistent they're complimented by a fresh, overarching mini theme season after season. What's the story behind your collection for Fall-Winter 2016? 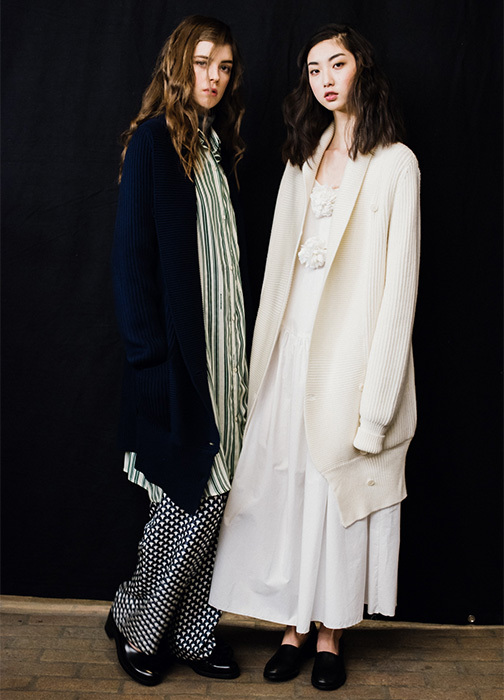 There were a lot of ideas at play for Fall-Winter 2016, mostly about romanticism. For example, the romantic pantomime, Pierrot, rich Venetian interiors, and a little bit of the playful Bauhaus dance costumes. Does the collection tell a story about a particular character that you imagine in the clothing? Yes. For this collection, I was thinking about this hopeless romantic that is Pierrot and how he spends a lot of time pining for his love, Columbine. I imagined the story between and behind the two characters - their beauty, playfulness, and naïveté. Can you talk a little bit about the music chosen for the presentation? Glasser performed some yet-to-be-released music at the show. I love her so much. She has such stage presence, and such a beautiful voice. Her music is very ethereal but at the same time super modern. I think it works well with this collection. We loved the soft, romantic hair on the runway. How did you decide on beauty direction? A beautiful woman should never look like she’s tried too hard. I wanted the models to looks as if they had their hair in braids all day and just brushed it out to be wild, beautiful, and carefree. Are there any fan-favorite styles in this collection that have been carried over from past seasons, perhaps with a twist or an update? We introduced a lot more denim this season, and most of the denim styles are best-selling silhouettes from past seasons, for example, the Henry Pant, the Perry Short, and the Starr Pant. We also did the Maison Pant and Hesse Jacket in velvet. What are the key new pieces? I love all of the velvet pieces. I also really love the new vertical print on easy, flowing pieces. The ruffled styles are very important in this collection as well. They’re more decorative for us but in a very fun way. Is there a Fall-Winter style you're already wearing to death or can imagine wearing often? I love the Starr Pant in denim. I have these pants in so many different fabrications and cannot wait to get the denim version. I also love the Sauza top, which is an oversize ruffle neck blouse. I love oversize shirts. Are you personally excited about any other Fall-Winter 2016 collections? Who do you plan on wearing with Creatures of Comfort? I love the Dries van Noten and Lemaire collections. I plan to wear it all with my Quarry jewelry. Have you started thinking about next season? I find a lot of inspiration in travel. For Resort and Spring-Summer 2017, I think the theme will deal with migration in some way.